Mahlon E. Balderston Jr., 95, of Santa Barbara, California, passed away on January 6, 2019, after a short illness. A well-respected music teacher, composer, and organist, Balderston first learned to play the piano as a child prodigy, around age 5. He was born in Trenton, New Jersey on November 9, 1923. After his military service in World War II, he began his formal training at Oberlin Conservatory of Music on scholarship in 1949. He subsequently attended Iowa State where he received his master’s degree in music composition and moved to Santa Barbara. 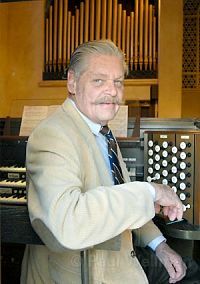 In his retirement years, Balderston remained very active in music, playing for the Samarkand community, Trinity Episcopal Church, and various venues around the Santa Barbara and Ballard areas. He often played his original compositions and arrangements for events held at these venues, and was particularly well known for his participation in the “Advent Grande” series at Trinity Episcopal Church during the holidays. He was a most beloved and resilient man, father, friend, and mentor, who loved cats, cruise ships, and prolifically writing postcards and letters. A man of refinement, he never failed to send a thank you note. Mahlon always held himself and his music to the highest standards. He was happiest when involved in music or behind the organ, playing and teaching. He loved Saturday mornings at Mesa Café with family and friends, reading suspense novels and he especially loved Piano Concerto No. 3 in D minor, Op. 30 composed in 1909 by Sergei Rachmaninoff. The special place he leaves behind in our hearts and in the community will long be felt. Balderston was so proud of his accomplished sons and daughters-in-law. He is survived by his three sons: Mahlon III “Lonny” of Thousand Oaks; John (Kimberly) of Fort Worth, TX; and Stephen (Megan) of Clarendon Hills, IL; as well as six grandchildren: Lauren Tevis (Matthew), Andrew, Michael, Katie, Celia and James; great-grandchild, Lyla, as well as Lyla’s “sister-on-the-way” in spring; and many beloved friends who were like family to him. The family would like to thank the exceptional staff at Sarah House Hospice for giving Mahlon comfort and care in the last weeks of his life. Per his request no funeral service will be held. A memorial tribute to his life is planned for January 20, 2019 at 3:30 p.m. at the Unitarian Society in Santa Barbara. In lieu of flowers, please remember Mahlon through donations to the music scholarship foundation in his name at Santa Barbara City College, or Sarah House.